A lively mix of songs and tunes from the musical traditions of Ireland, Scotland, and Cape Breton, Nova Scotia, with a pair of blazing fiddles and plenty of jigs, reels, strathspeys, and classic Celtic ballads. 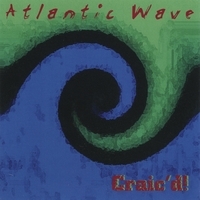 Atlantic Wave takes their name from an Irish reel, and from the fact that they play Celtic music from countries touched by the Atlantic Ocean, with a special emphasis on the traditional music of Ireland, Scotland, and Cape Breton (in Nova Scotia, Canada). Atlantic Wave's sound is based on a duo of fiddlers, Kaitlin Hahn and Ed Paloucek, who are accompanied on guitar by Barry Houlehen and on bouzouki (similar to a mandolin) and bodhran (the Irish drum) by John Karr. In addition, Barry sings a variety of songs, both traditional and from the canon of contemporary Celtic folksongs. Atlantic Wave's live performances feature a mix of high-energy jigs, reels, strathspeys, and slip jigs, with some slow airs, classical selections, and other World music influences thrown in. The songs Barry sings range from uptempo Scottish and Irish favorites to slow ballads, ranging in age from hundreds of years old to very recent.